The wife of former Trump adviser George Papadopoulos has garnered much attention for her media appearances in which she proclaimed that Papadopoulos would be remembered as a John Dean figure, before completely changing her tune, claiming Papadopoulos was set up by the FBI and other allied intelligence agencies. She is the leading voice behind the conspiracy theory that the Maltese professor who told Papadopoulos about dirt on Hillary Clinton was actually working for Western intelligence. Mangiante worked for the Professor from September-November 2016, according to her own accounts. Mangiante’s public persona is as intriguing and interesting as her claims about the Russia investigation. She has portrayed herself as an actress, model, fashionista and lawyer focused on international issues, including child abduction. However, a weeks-long investigation into her international background has revealed that she isn’t being truthful with at least some aspects of her background. The revelations come as Mangiante has revealed that FBI investigators questioned her about being a Russian spy. “I used to work as a diplomat at the European Parliament for a few years and this could be a red flag because many officials at European Union actually — it’s a cover-up for spy jobs,” Mangiante told ABC News. She has denied that she has any affiliations to intelligence agencies or any ties to Russia. John D. Tuerck, a firm spokesman, categorically denied that Mangiante has ever worked at Mayer Brown. “We have no record indicating that someone named Simona Mangiante has worked at Mayer Brown,” he said. In an apparent effort to rebuke Tuerck, Mangiante posted a letter on Twitter purporting to be from John P. Schmitz, a former partner of Mayer Brown. The letter appears to be an offer of an internship from Mayer Brown to Mangiante. She did not address how this letter supported her claims that she was a licensed Associate with the law firm. The Mayer Brown spokesman maintained that they had no records that Mangiante was ever employed at the firm, and that the HR department had “checked carefully.” Schmitz new law firm did not immediately respond to a request for comment. Revisiting Mangiante’s LinkedIn also reveals an education timeline that appears to make little sense. According to the Law Society of England and Wales, to be able to practice law in Italy, one must “complete a five-year law course at an Italian University and a traineeship of at least eighteen months at an Italian law firm.” In addition to these six-and-a-half years, the prospective lawyer has to pass the country’s Bar exam. Mangiante claims that she only attended school in Italy for four years total, which would make it implausible for her to be a licensed lawyer. A search of the last name “Mangiante” in a database of eligible lawyers in Rome and Milan shows no results. According to her LinkedIn page, Mangiante lists Rome as a location for her current “international law and government advocacy”. This search doesn’t appear to be comprehensive for the entirety of Italy, meaning Mangiante may be able to practice law in a different part of the country. A search of the Naples Bar Association confirms that Mangiante is registered to practice law there as of late 2010. Thus, unless registered elsewhere, her educational timeline and practice as an associate prior to 2010 appear to be misleading. Requests for records and comments to three of Mangiante’s listed universities went unanswered as of the time of this publication. New York University, where Mangiante says she participated in the exchange program, said that records of exchange students are confidential. Family members and friends of the former Trump adviser George Papadopoulos say that his new wife has been misleading about her age, employment history, and details about her activities in 2016. Over a period of two weeks in late September and October, two family members and a former colleague of Mangiante informed me of their concerns about Mangiante’s truthfulness with the public about her background. All three spoke on condition of anonymity because of the sensitivity of the topic. Legal documents described to me by two sources allege that Mangiante is not 30-years-old as described in an article earlier this year, or 34 as depicted in a European Parliament biography, but rather 37, with a birth month of January 1981. One of the sources claimed that after repeated questioning by family members, Mangiante admitted her true age of 37. The two family members told me that Mangiante told friends and family that she lived in a small one bedroom condo in South Kensington during her time in London in 2016, partially corroborated by a story in the Guardian. However, domain registration details for a website set up by Mangiante in October, 2016 show that her listed address was not a 1 bedroom condo in South Kensington, but rather a 2 bedroom, $1.5M flat in the Hampstead area of North London. It is unclear if Mangiante was actually residing at this address or if she listed an address other than her own. After originally stating that she stayed at one address, Mangiante later corrected the record, stating that she indeed had three addresses in London. The owner of the flat appears to have no connection to Mangiante, and all available evidence points to the idea that she rented the property, which would’ve fallen at approximately $4,500 per month according to the UK property company Zoopla. 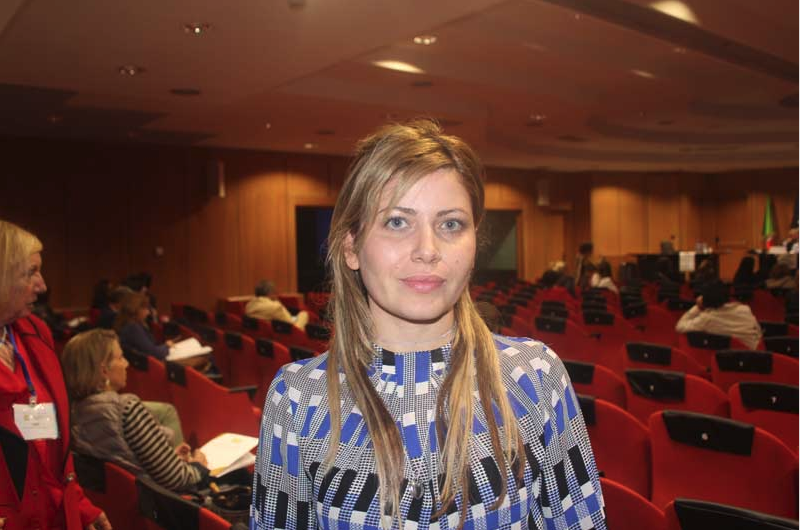 Mangiante claims that she was never paid for her work in London, which happened to be for Professor Mifsud. 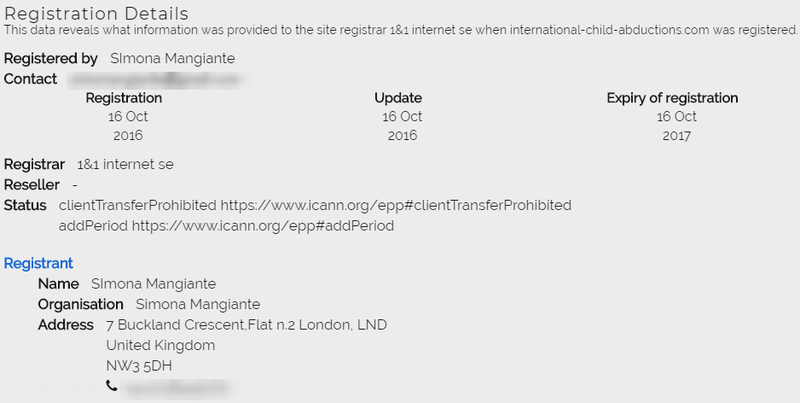 An archived version of the now deleted website for “International Child Abduction Slovakia” shows that Mangiante was indeed the spokeswoman, though the website wasn’t registered until October 2016, after Mangiante had already been in London. The purported background of Simona Mangiante is deceptive at best. The years leading up to her involvement with the European Parliament appear to have been falsified or greatly exaggerated. Peter Carr, a spokesman for the Special Counsel’s office, declined to comment on Mangiante. She has not been charged or accused of any wrongdoing.